This entry was posted in Italian culture, Italian language and tagged Italian culture, Italian language, Italian newspapers on January 2, 2009 by Deirdre Straughan. One small point: I wouldn’t say that a notaio isn’t really much “between a notary public and a lawyer”, but is more like “a lawyer with special additional notary public powers, and, more importantly, royal notaio blood”, as a notaio can call fees (well) beyond those of normal lawyers, and the process of getting a “studio notaio” is nearly unthinkable if not by legal bequest of heredity (or at the very least marrying into the family of a notaio). The licensing for new studios is “super-restrictive” and basically impossible. P.S. the soccer season is divided into two halves, Andata e Ritorno, in each of which they play all the same teams, once during the andata beginning half and once during the ritorno winding down towards the end of the season. Kind of a temporal sailing regatta buoy – half way there and half way back to the finish (Coppa! – trophy championship). Generally, one match is played in one team’s stadium in Andata, and in the other team’s in Ritorno, theoretically to even out the home team advantage over the season between the two teams. 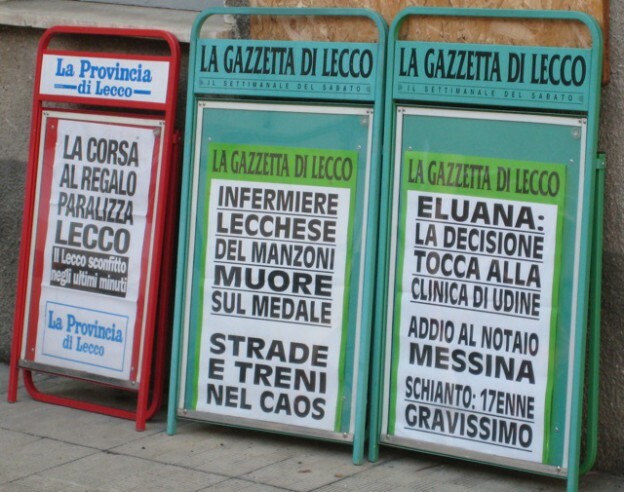 So have you got an update to 2009 newspaper headlines?